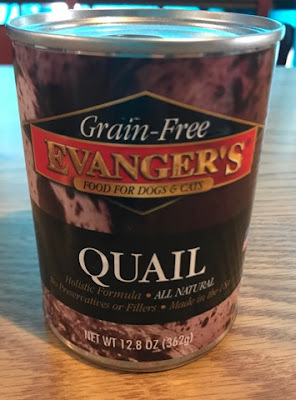 We received cat and dog food as well as treats from Evanger's Dog and Cat Food for a review. If you are looking to put your pet on a special diet or if your animal suffers from allergies or obesity Evanger's Cat and/or Dog Food may be the answer you are looking for. 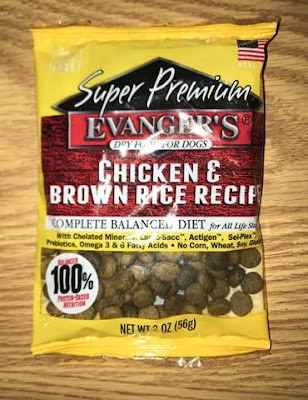 Evanger's offers hand packed gourmet dinners and balanced meals for animals of life stages, breeds and ages. They were voted editor's choice for two running years by Pet Product News International. 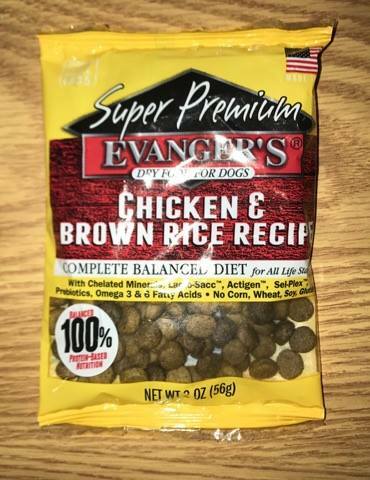 We received Chicken with Brown Rice Dry Food. This was formulated to meet the nutritional levels established by the AAFCO nutrient profiles for all life stages. Puppies, pregnant and nursing dogs may require 2-3 times above amounts, and reduced for less active or older dogs. Amount of food your dog requires depends on activity, age, environment and breed. We also received dog food it's recipe called Quail. Evanger's Single-Ingredient Quail is Grain-Free and Gluten-Free. This is a 12oz. can that can be mixed with Evanger's canned Vegetarian Dinner to make a balanced, and very nutritious diet. Quail is endorsed by the cRc Kosher for Passover. 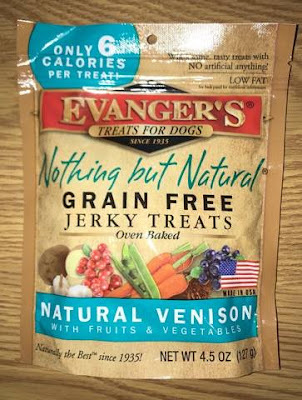 Evanger has a line of dog treats called Nothing But Natural. We received the Beef treats. Along with Beef, a unique meat, farm-fresh blueberries and cranberries are also added. This is a low-calorie and grain-free treat. My pets love the food and treats from Evanger's Dog Food. We have had so many that he didn't digest properly and has gotten sick from, this was great! I love how healthy it is but also makes it appealing to him to eat. 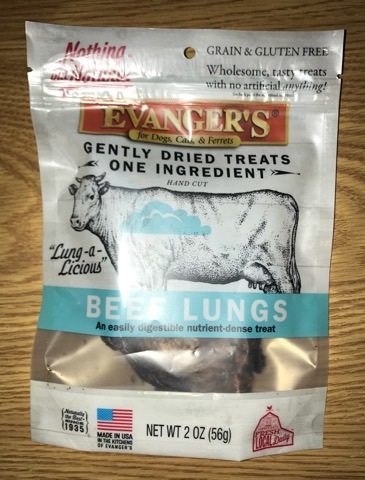 Evanger’s utilizes high-quality, inspected meats to make highly palatable and nutritious foods that will satisfy even the most finicky of animal eaters. With no soy, corn, wheat, artificial ingredients, preservatives, harmful additives or by-products, Evanger’s canned meals make an excellent mixer to their dry foods. Not only do they offer your pet a variety in taste, their gourmet dinners offer the additional nutritional benefits your pet needs. Natural Vitamins and minerals are blended with the all-natural meats for ultimate nutrition that are completely balanced meals for all life stages, ages, and breeds. I've been looking at healthier options for my cats. I want them to be healthy and live as long as possible. I definitely need to find a grain free food for my cat--I will see if I can find this in the stores. I like that they are all natural. We always want what's best for our pets. These all sound great. My dog loves trying out new treats. This looks ideal for people who are looking to put their pets on special diets, keeping your pet healthy is really important! I've heard so much about this product. I am always looking for something healthy for my cat. This would be really perfect. I've never heard of this brand, but it looks like it's pretty good! I'll have to check it out! Sounds like a great brand for animals, that is of course if the main ingredient is meat? can't ever really tell unless you look at ingredient list. My dog would love these treats and food. We feed him a grain-free diet because he is gluten intolerant. He also love veggies and fruits.